A black and white image taken on September 16, 2013 appears to show a huge building, partly visible from behind a rock formation. 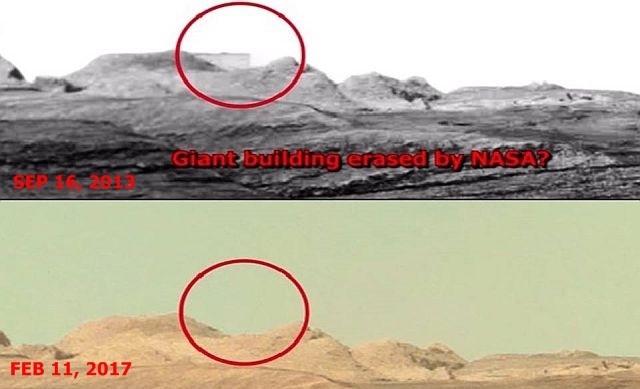 A second image dated February 11, 2017 shows the same rock formation but now in color, but surprisingly the building has been disappeared from the picture. The fact that NASA still airbrushing objects out of Curiosity mars rover images, like the above images, proves again that they hide evidence of (former) life and activities on the planet Mars. In addition, these two images confirm the statement of Donna Hare, who had a secret clearance while working for NASA contractor, Philco Ford. Once she was shown an original NASA photo of a picture of a UFO and while asking to her colleague if the object was a real UFO the colleague explained that it was his job to airbrush such evidence of UFOs out of photographs before they were released to the public.